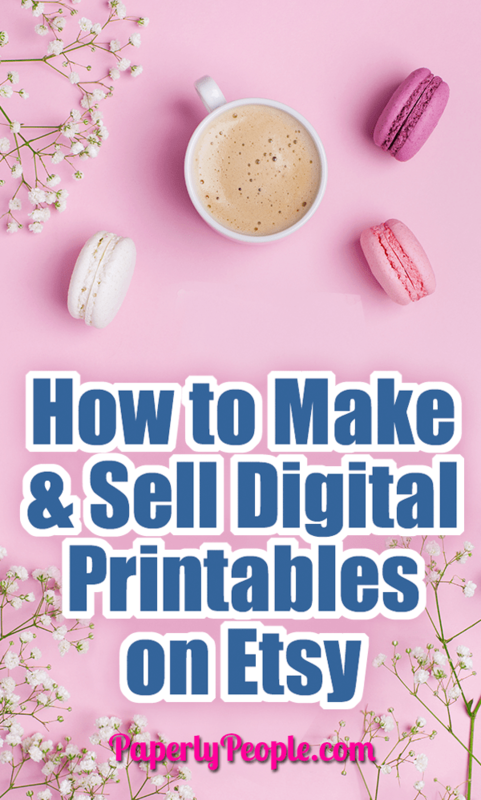 Tips and ideas for how to sell digital printables on Etsy. Full of practical and real world considerations for when you are getting started on Etsy with your new shop. Find out how many items you need, how to save files and more! 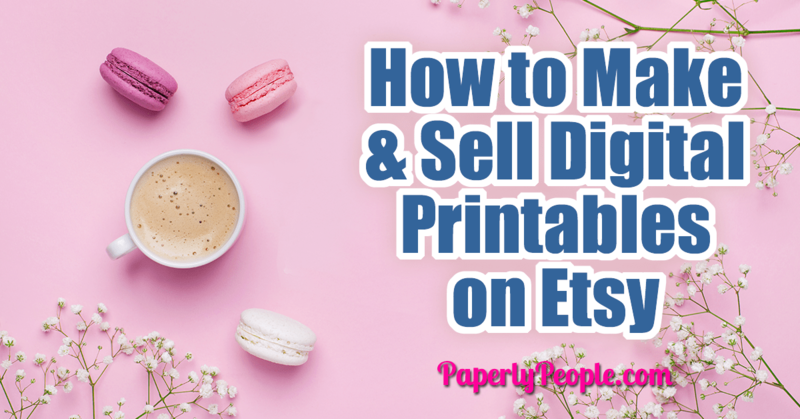 Whether you are an artist with digital art or business forms in digital format or some other kind of thing you can send to others digitally, you can really make a good income making and selling digital, printable files in Etsy. It’s a low maintenance way to feed your creative side while making money to support it and yourself. 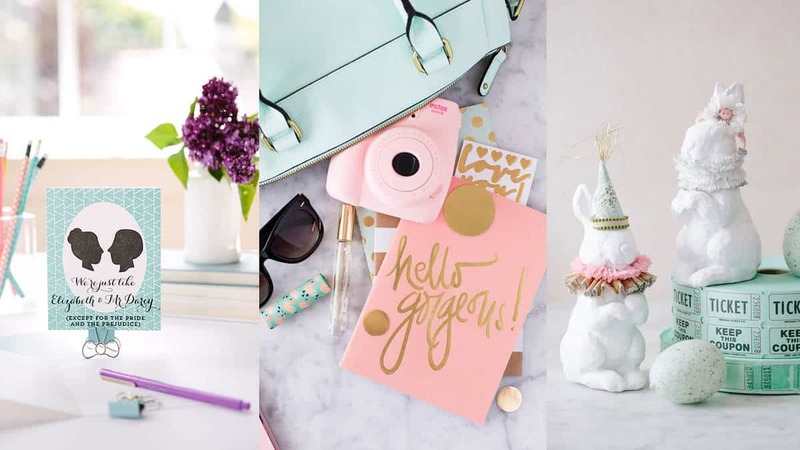 Etsy is the go to place for all sorts of things, hand made and digital. Before you get started there are a few things that you should check into. For example, say you have THE BEST idea to make a journal and this is going to be a cornerstone of your shop. You go ahead and make up all kinds of “bullet journals” for different niches and then… wah wah wah… you find out that this is a trademarked term and you get a cease and desist even though they are already all over Etsy. You also need to open an Etsy Shop. It’s not hard to do. Register as a seller and create a storefront. Set up a PayPal account or other means to accept payments. Also, be sure to read the Etsy guidelines to be sure you don’t violate any of their rules. The best way to decide what to create and sell is finding something you use or would use, love to do, or are asked about by others. If it’s art, keep to your own style. There is a niche out there for you. If it’s business forms or planner stickers, think about what you need in your own business. If you need it, someone else does too! I started my digital Etsy store, Paperly People, with all of the forms that I had already made for myself! Come to find out I am a little bit of a form nerd. Before you open your shop, design your first few products. Looking at a store with just a few measly items could scare off your buyers. A good mark to have is at least 6-8 products ready to go when you launch! That way your store will look more full and really in business. 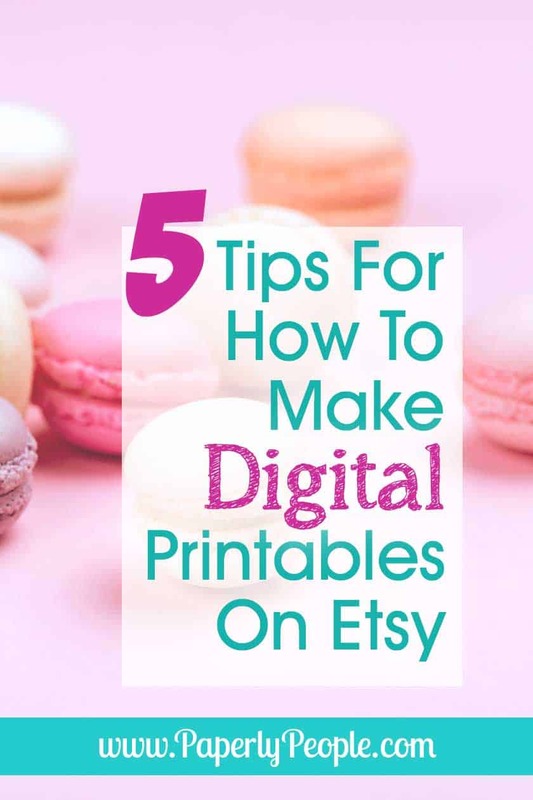 You can include up to 5 different files with your digital product in Etsy. Always keep your customer and end user in mind when designing your digital product. If it’s something that needs a high-resolution print, or requires a lot of color ink to print, people may not buy. Include a cover page either in the pdf or as a separate file with instructions and suggestions. Pro tip: You can include a “right to print” page that they can print out and take with them to Staples or Kinkos. That way the print shop will print it out for them! Don’t be afraid to brand your products. If they are art, put your digital signature on it. Artists always sign their work. If it’s some kind of gift item, make it unobtrusive, but keep in my want to purchase something from you too. Without at least your name on it, they won’t know how to contact you. Put your name/logo and website on it. Whomever buys it will need to be able to know what it is by the file name when they get it on their computer. For example my Etsy Planner file name is “Etsy Planner.pdf” Not super unique but easy to for your buyer to find once they download it. Keep your digital file sizes manageable. Maximum file size should be 20MB and you can load up to 5 individual files per item listing. Create your listing with a clear and simple title. The title isn’t the place to get seriously descriptive! If your product is a to-do list, put to-do list in the title. If it’s a planner page, put planner page in the title. Also be sure to put “Printable” in the title and description. Don’t assume people will figure it out. Be sure to have a great image, whether photograph or digital image, of your product. Etsy maxes you out at 800×1000 pixels per image, and square images are best for the way Etsy manages their search engine. If your images are different shapes, just be sure the first image is square. If there are specific directions or restrictions involving your product, make sure they are in the description. These may include restrictions such as “This product may only be used for personal use by you or for your business. You may not share this file with others, or re-sell it.” or instructions on how to assemble, frame, etc. Of course, a big question is how you price your items. A good way to start is to search Etsy for similar products. Don’t sell your time and effort short, and add in expenses like Etsy fees when deciding. You shouldn’t overprice yourself, nor should you sell yourself short. Always use the best customer service. Answer convos promptly and use their questions as suggestions that can improve your product. Treat all queries as important questions. Not everyone understands tech. Never take a condescending tone or make a customer feel stupid for asking questions. then include your contact information. Previous Post: « What Can You Sell On Etsy?